How is my pet likely to respond to the new arrival? How much exposure has your pet had previously to children? How has your pet reacted when it has been exposed? The most serious concern would be with a pet that has previously reacted aggressively or fearfully with children. If there have been prior problems, you should consult with a veterinary behaviorist to determine which situations have previously led to aggression, and the safest way, if any, to make the transition. If the pet's previous problems were with a specific child, a specific age group or under specific circumstances, it may be possible to design a program that emphasizes safety and works to adapt the pet gradually to stimuli and situations that are similar to the previous situations in which the pet was aggressive to a child. A desensitization and counterconditioning program may improve or resolve the pet's anxiety prior to the arrival of the child (see our handouts on 'Behavior Modification - Desensitization and Counterconditioning'). In addition, there must be a means for physically and verbally controlling the pet so that safety can be insured when the child and pet are together. 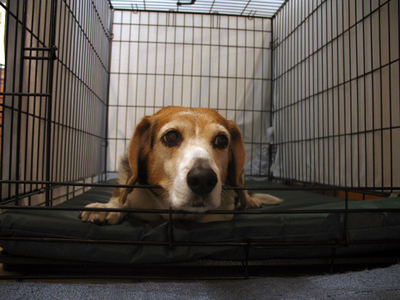 "Without any prior experience, it is difficult to predict how the dog may react." The next most serious concern is the pet that has had little or no exposure to young children or babies. Without any prior experience, it is difficult to predict how the dog may react. A lack of early socialization to children may lead to some initial anxiety or fear associated with the sights, sounds and odors of the new child. If there are no unpleasant experiences when the child first arrives, and the first few introductions are made positive, there may be no problems. Even if a pet has shown no previous problems when interacting with children, keeping all introductions positive will help to get the relationship between your pet and your new child off to a good start. One final concern is how your pet will respond to the growth and development of your child. As your child progresses from being carried to one that rolls, crawls, and begins to walk, and so on through childhood, some pets may have trouble adapting to one or more of these changes. Fear, dominance challenges, possessive displays, and playful behaviors could result in aggression. Anxiety or fear could lead to anorexia, compulsive disorders (e.g. flank sucking, acral lick dermatitis), or destructiveness (e.g. house-soiling, marking, chewing, digging). Remember, regardless of how your pet may respond, a dog and a young child should never be left alone unsupervised. What can we do to prepare for the new arrival? Behavior problems (destructiveness, house-soiling, compulsive disorders, increased demands for attention, generalized anxiety) may not develop directly because of the arrival of the child, but rather from the changes in the household associated with the new arrival. With nine months to prepare for a baby's arrival, the best way to minimize problems and help the pet to cope is to make changes gradually so that they have been completed prior to the arrival of the child. Consider any changes that you may need to make in the pet's schedule, housing, play, exercise or attention, so that adjustments can begin to be made well before the baby's arrival. Design a daily routine of social times and alone times that can be practically maintained after the baby arrives (see our handout on 'Training Dogs – Enrichment, Predictability and Scheduling'). Be certain that the program meets all of the dog's needs for physical activity, social contact and object play / chew toys. Set up the nursery in advance and if the pet is to be kept out of the room, access should be denied before the child's arrival. If your intention is to allow your pet to continue to enter the room when supervised, begin to accompany your pet into the nursery so that it can adapt to the new odors and new setup. The dog should be allowed to investigate the baby's room, blankets, and new furniture, and praised or given a small food treat so that it can develop a positive association with each of these new cues. "Any existing behavior problems should be resolved before the arrival of your baby." For dogs, reviewing or upgrading obedience skills is essential so that you can safely and effectively control your dog in all situations (see our handout on 'Training Dogs – Learn to Earn and Predictable Rewards'). Obedience training should be reviewed every day, in a variety of locations and circumstances. Practice each command in different rooms of the home, in the yard, while out on walks, and when visitors come to the home. Concentrate on those commands that are presently the least successful, using prompts and rewards to achieve success and then gradually shaping the response so that the pet stays for progressively longer times, comes from greater distances and will heel and follow even when there are distractions. Any existing behavior problems should be resolved before the arrival of your baby. Using a head halter will facilitate control and the learning of these tasks. Are there more specific preparations that I can make as the time of arrival approaches? Some pets might become anxious of, or fearful toward, any of the new and different stimuli associated with the sights, sounds, or odors of the new child. New activities associated with childcare can be practiced in front of pets so that they can become familiar with them. Tape recordings or videos of babies crying (see our handout on 'Behavior Management Products'), holding a doll wrapped in a blanket, taking your dog for a walk beside a stroller or baby carriage, or even going through the motions of changing a diaper and applying baby powder will simulate some of the experiences to which your pet will soon be exposed. If there is any sign of anxiety associated with any of these situations, then more formal reward-based training should be practiced and repeated until the pet exhibits no problems in the presence of the stimuli. By providing a favored chew toy, giving a food reward, or providing extra affection during these activities, your pet may actually learn to enjoy these new stimuli. Once your pet shows no fear or anxiety in some or all of these situations, you may want to enlist the help of some friends or relatives with young children. Dogs can be taken for a walk while the child is rolled in the stroller or carriage. A baby can be carried around the home or nursed in the presence of the dog, and children should be encouraged to play at the opposite end of a room or yard from where the dog is situated. The dog must be well controlled, preferably with a leash and head halter, and given food rewards and/or play to keep the association positive. A wire-meshed or plastic basket muzzle could also be applied to ensure additional safety, especially when being exposed to new situations. By the end of the visit it may even be possible to let the dog interact with the child but only if it remains friendly and shows no fear or anxiety. Is there anything special I should do for my cat to prepare for the arrival of a child? "For cats, the most important adaptation is to any changes that will be needed in the cat's home." For cats, the most important adaptation is to any changes that will be needed in the cat's home. Although fear and anxiety to the sights and sounds of a new baby are possible, adapting to changes in the household are often the most trying for cats. For example, obtaining new furniture, altering the cat's feeding, sleeping, elimination or play areas, and trying to keep the cat out of certain locations such as the crib, should all be considered before the arrival of the baby. To reduce the chances of the cat marking new furniture, the first few introductions to the new areas should be well supervised. Once your cat has investigated and rubbed against the new furniture, spraying is far less likely. Similarly, when the crib or cradle is first set up, the cat may wish to mark the area, or investigate, or even to sleep in the crib. Booby-trapping areas (see our handout on 'Undesirable Behavior in Cats') can teach the cat to stay away from the areas of concern well before the baby arrives; in many situations, synthetic pheromones (Feliway TM) can help keep the cat calm and prevent spraying. Remember, each of these techniques are intended to help the pet adapt to changes in the household or lifestyle before the arrival of the baby. Once the baby arrives, there will be far less time to deal with the needs of the pet, and there will be additional variables to which your pet will need to adapt. Even if your pet does begin to exhibit fear or anxiety during this pre-arrival training, such anxiety will not be associated with the presence of the child. The cat will have no reason to develop animosity to the new child. What should be done when the baby arrives? Progress gradually, avoid any situations that might lead to fear, anxiety or discomfort in the baby's presence and make all associations and experiences in the baby's presence positive. Maintain or even increase the amount and type of training, exercise, and play. When necessary use your pre-trained confinement area when you need to concentrate on the baby without interruption. Even a curious and affectionate pet may have some problems adjusting to the new arrival. Jumping up in greeting when the baby is being carried, barking during the baby's sleep or nap times, raiding the diaper pail, licking the baby's face, or cuddling up to sleep against an infant who is still unable to shift position are just a few of the concerns and potential problems that pet owners may need to deal with. Keep your pet's nails well trimmed. Supervise all interactions between the pet and baby. Keep the pet out of the baby's room during nap and sleeping times. Ensure that your dog is well controlled and responsive to obedience training commands. For some dogs, leaving a leash attached (preferably to a head collar) is a useful way to ensure additional control. "Every effort should be made to allow the pet into the room for food, play or affection when the baby is present." The most important aspect of retraining is to reward the pet for obedient and relaxed behavior in the presence of the child. In many households there will be less time and energy available for the pet. While focused on the child, or attending to the chores associated with parenthood, the pet may be ignored, disciplined for approaching too close, or confined to a different area of the home. Your pet may still receive its play, exercise, affection, food and attention, but often not until the baby is finally asleep or is under the care of some other family member. Many pets soon learn that the presence of the baby is a time for inattention, confinement, or even punishment, while the absence of the baby is a cue for "good things" to happen. This must be reversed. Every effort should be made to allow the pet into the room for food, play or affection when the baby is present. Feed the pet when the baby is being fed, or have another family member give affection to the pet, play with the pet, or do some reward training (stay, go to your mat) when the child is in the room. 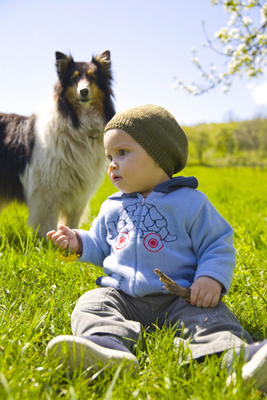 Take your dog outdoors for play or a walk when you are taking the child out. The goal is to teach the pet that positives or "good things" are most likely to happen in the presence of the child and to avoid any negative association with the child. What should be done if aggression arises? Such behavior is very upsetting, regardless of its reasons. An immediate decision on whether to keep and work with the pet or remove it from the home must be made. Dogs targeting children may be motivated by fear, dominance, possessive, redirected, playful or predatory aggression. Such aggression (particularly predatory and fear) may arise immediately when the child is brought into the home, or may begin as the child becomes more mobile (e.g. fear, predation, possessive, play) or when the child grows a little older and begins to challenge the dog (fear, dominance, possessive, play). 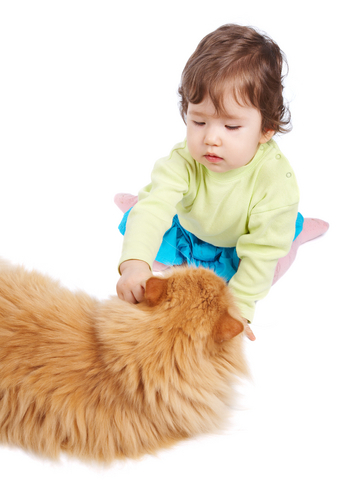 Cat aggression toward children can be fear-induced, redirected, territorial, or play/predatory. For most aggression cases, especially those directed toward children, the guidance and advice of a behaviorist is strongly suggested since it will be necessary to make an accurate diagnosis, determine the prognosis (the chances of safe and effective treatment) and guide you through a treatment program. Although some cases may be treated quickly and safely, most cases require extensive precautions to prevent injuries and a great deal of time, effort and commitment. Regardless of reason for aggression, biting dogs should be leashed (attached to the owner) preferably with a head collar, muzzled and closely supervised or crated in the presence of small children. Aggressive cats should be confined away from small children except when they are in a carrier, on a leash and harness, or well supervised and either calm or otherwise occupied with food or toys. For a discussion of specific types of aggression ask for our other handouts. How can I teach my children to be safe around pets? Although there are no rules that will guarantee safety, there are important guidelines that can be followed to reduce the chances of problems and the risk of injury. The first rule of thumb is to avoid doing anything to the dog that you might not want your child to do. This would include physical punishment, rough play, or teasing. Children must be taught how to interact with and handle their family pet including how to approach, pat or lift small pets. Wherever possible, play sessions and training should include the children with the supervision of a parent. This can begin from the time the dog is a puppy by attending puppy classes and obedience classes that include all members of the family. If the pet has not previously exhibited possessiveness of food or toys, the adults can practice with the children approaching the dog at its food bowl, patting and giving favored treats, along with teaching the give or drop command for favored treats. It may be best to use a leash and head halter during this training if there is any concern that the dog might resist or become anxious. While your dog may appear to tolerate or even enjoy handling from people of all ages, you must teach your child how to meet, greet and handle animals. The child will be safest if taught to avoid hugging, tugging on the leash, collar or tail and handling around the eyes, ears and muzzle. Even if the dog is familiar it is best to avoid reaching toward the head or face-to-face greetings. "Children must also be taught that strange pets may not behave in the same way as their family pet." Children must also be taught that strange pets may not behave in the same way as their family pet. A simple rule is that the child should NEVER approach another family's pet without being given permission and then to approach slowly and avoid reaching for the head and face. Children should be taught to avoid pets entirely if they are displaying any signs that might indicate fearfulness (shaking, ears back, tail between legs, crouch, trying to escape) or aggression (growling, showing teeth, barking, hair standing on end). Although most children would be tempted to run away from an aggressive dog, they should be taught to stand still like a tree, with the arms against the body, and avoid eye contact and yelling or screaming. If the child is on the ground they should curl up and cover their head and ears with their arms and fists, and remain still until the dog moves away. Any threatening dog or bite should be immediately reported to an adult.